This album offers a fresh and creative reexamination of the business and technology soundtrack. Modern, sleek cues with an uplifting sensibility create an ideal backdrop for scenes of activity, fulfillment and accomplishment while displaying a startling instrumental variety throughout. 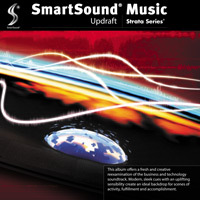 As a Strata series album use SmartSounds Mood and mix tools in its Sonicfire Pro software or Quicktracks web-system to create unlimited ways to bring your own interpretation to these powerful yet crisp sounding cues.